In our household, it is my job to take care of the strawberries every summer. So for about a month spanning from April to June, I spend my mornings at the crack of dawn stepping through the strawberry bushes that swarm the backyard planter. I peer beneath leaves for the plump, ripe fruit and pick whole bins full, constantly being frightened by the leaping grasshoppers that also call the plants home. I wash and de-stem and load them into Ziploc bags for the freezer after eating the finest specimens for breakfast plain or on top of yogurt and hearty grains. The frozen bags become fuel for morning smoothies that last long into the warmest days. Come August, I start hankering for a different way to utilize the last berries—the runts and rejects, frozen stiff into bricks. This year I remembered a visit I had to my friend Elizabeth’s Venice Beach bungalow last year. She was breezy and in love with a German baker who had just flown back to Europe after a month spent in the throes of love on the beach where they had nested in her seaside home cooking and dancing. The last remnants of his presence were seen in a small crystal jar of refrigerator jam he had made before his departure. The sweet strawberry concoction was creamy with the scent of vanilla and we had shared it on fluffy white biscuits with our tea. 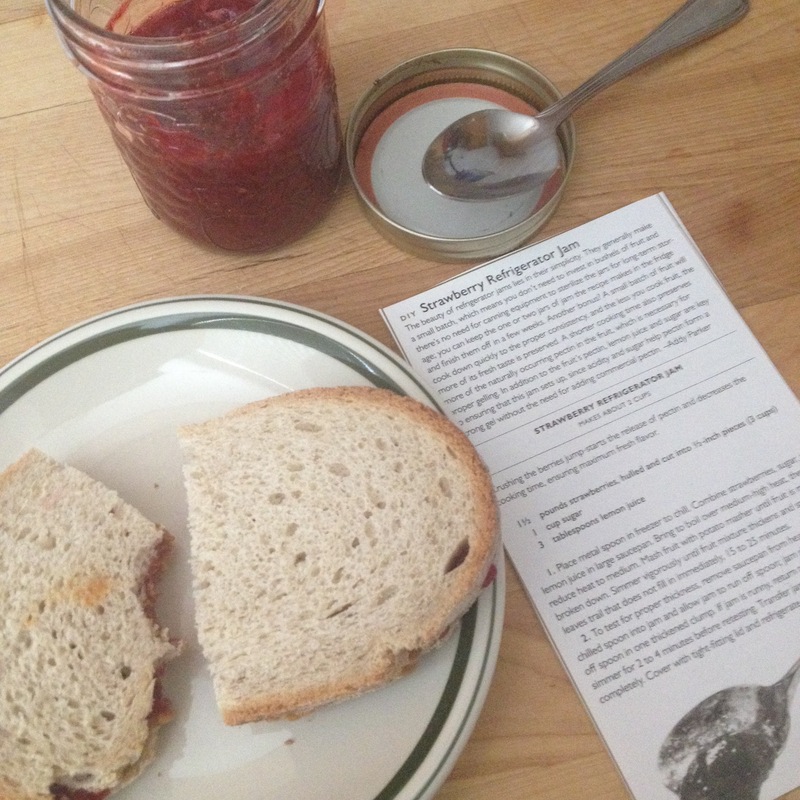 So, duly inspired, I found a Cook’s Magazine version of the refrigerator jam and made it for myself this year with the last remnants of my garden bounty. It was the perfect sized amount to savor for a week upon toast as I said goodbye to the sweet fruit until they sprout again. Place metal spoon in freezer to chill. Combine strawberries, sugar, and lemon juice in large saucepan. Bring to boil over medium-high heat, then reduce to medium. Mash fruit with potato masher until fruit is mostly broken down. Simmer vigorously until fruit mixture thickens and spatula leaves trail that does not fill immediately, 15-20 minutes. To test for proper thickness, remove saucepan from heat. Dip chilled spoon into jam and allow jam to run off spoon; jam should slowly fall off spoon in one thickened clump. If jam is runny, return to medium heat and simmer for 2 to 4 minutes before retesting. Transfer jam to jar and let cool completely. Cover with tight-fitting lid and refrigerate for up to 3 weeks.